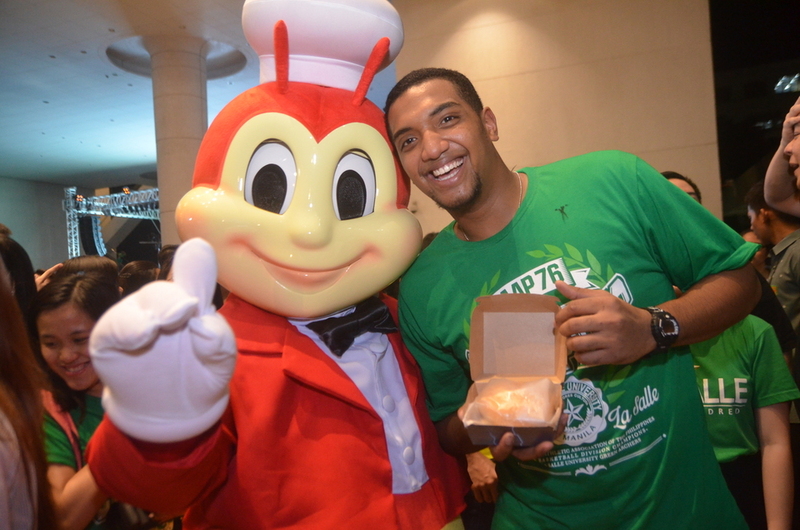 In his Green Journal, Green Archer rookie Jason Perkins talked about how among other things, Jollibee’s Aloha Burger was one of his most favorite meals here in Manila. Fast-forward to the Animo Night celebration and Perkins is called up on stage not only for the recognition he deserves, but also to receive a Bacon Cheeseburger since the Aloha Burger was unfortunately gone by then. It wasn’t long before the people over at Jollibee noticed his constant association with their brand, and after careful negotiations, the Mythical Five member will officially join the likes of Aga Muhlach and Jessica Sanchez as the official endorsers of Jollibee. Specific terms of the deal weren’t disclosed but aside from the usual appearance in billboards around the metro, Perkins mentioned that he would definitely play a crucial part in Jollibee’s marketing plan for 2014, particularly during the UAAP season. Already a sponsor of the UAAP, the move makes sense for the brand, as they will now add one of the tournament’s most popular faces to its roster of endorsers. Athletes in both college and professional ranks have been known to endorse products of all kinds, with the likes of Gabe Norwood and Manny Pacquiao among the bigger names to have graced print materials and TV commercials. Perkins’ teammate Jeron Teng, along with his brother Jeric, are already endorsers for McDonalds while Ateneo’s Kiefer Ravena has starred in numerous Enervon and Milo commercials. Despite representing rival brands, the Minnesota native believes the rivalry won’t carry over to their team. “I don’t think it’ll affect our play on the court but I’m sure we’ll have a long debate over lunch,” Perkins admits. With his two players on opposing sides, Green Archers head coach Juno Sauler decided to stay mum on what his preferred fast food chain was. However, he made sure to emphasize the fact that his mind wasn’t on food but on the court. “For me, I just hope that this does not become a total distraction for the boys,” Sauler said, adding that to prevent any hint of bias, he has decided to hold team lunches over at KFC instead. There was no definite time to when this endorsement will last yet Perkins believes that with or without this opportunity, he’ll still be a loyal Jollibee customer. With the season coming up, he admits that he’ll have to have less of the burger as the team sticks to a relatively strict diet whenever the UAAP season comes up. Yet right now, as one of the newest faces of the franchise, he plans to make the most out of his time before the season starts, specifically by airing out his sentiments on his favorite meal.